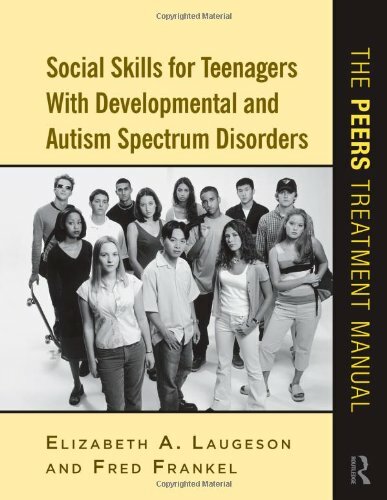 Social Skills for Teenagers with Developmental and Autism Spectrum Disorders: The PEERS Treatment Manual by Elizabeth Laugeson. This is a manual for researchers and clinicians working with teenagers on the Autism Spectrum. It includes strategies for social interactions with peers with specific topics being covered on gossiping, humor, choosing friends, disagreements, among others. Homework handouts accompany each topic. Research for this manual came from a 14-week program at UCLA’s Semel Institute for Neuroscience and Human Behavior. Pp. 448. This entry was posted in Our Library, Social Skills and tagged adolescent, Autism Spectrum Disorder, books, social skill. Bookmark the permalink.